‘Very hot’ is an understatement of Saturday’s brewery ride! 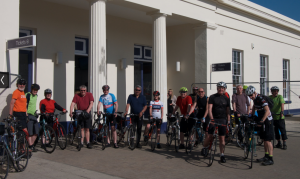 We profited from the usual good weather to reprise our earlier River Ride, with Steve leading, despite this being a flatter and shorter ride than his usual. We ventured very slightly south of the river overcoming all obstacles, notably a lack of a lift on the Greenwich side of the foot tunnel. Instead of photos here is a video of the route taken. The Hoo peninsula is a wild and desolate place, especially on a cold winter’s day. 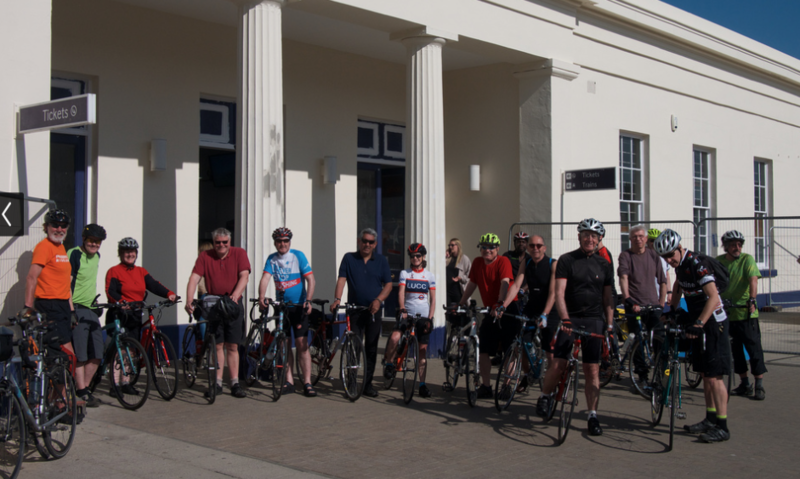 However, with Gravesend only 17 minutes from Stratford international station it is a very accessible location to explore on two wheels. 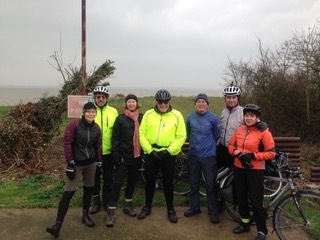 The eight of us left Gravesend and cycled anticlockwise around the peninsular. 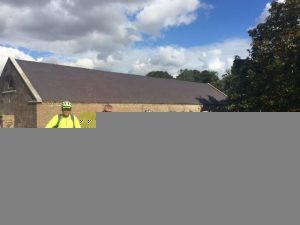 At Lower Higham we picked up the national cycle network route across the agricultural landscape, with lots of polytunnels and orchards. Along the Medway coast we went through Hoo St Werbergh, the largest settlement on the peninsular. We passed the infamous Kingsnorth dual oil and coal fired power station on our right as we rode over the central ridge and could see the confluence of both rivers in the distance, beyond Grain. 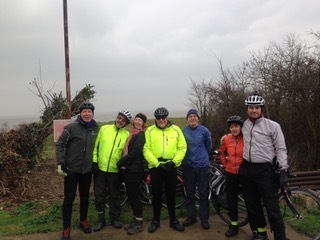 At Allhallows, the most easterly point on route, we stopped at the mobile home park for a photo opportunity with the North sea and bright lights of Southend in the distance. 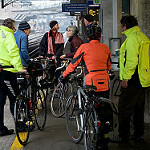 We all knew that this ride would not be dry, despite the weather forecast. The day started cold and cloudy as we met at the Viewtube base camp for the much previewed brewery ride. The idea for this ride came from and article in the London Cyclist magazine a few months before. 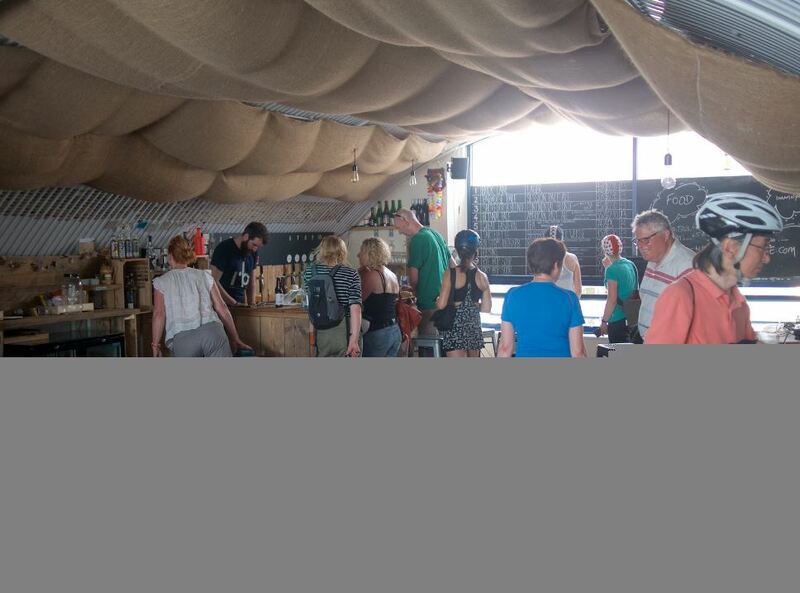 They had suggested a tour of six taprooms and microbreweries in east London. 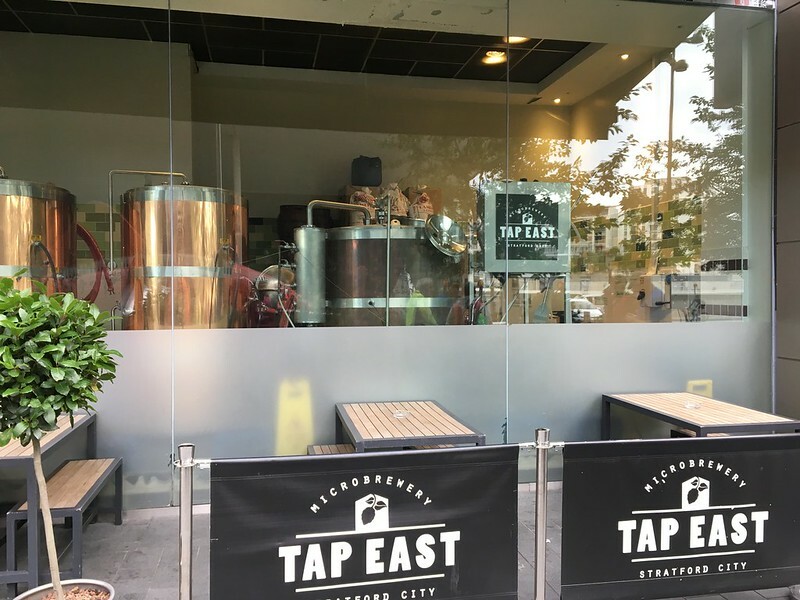 However our own resident expert, Bill, had discovered that there were approximately 20 breweries in east London, some in pubs, some with taprooms and some without, and we could therefore improve on this small sample. Although it was ambitious to cover all twenty breweries, we decided to limit the stops to three, Howling Hops, I Mile End and Wild Card. 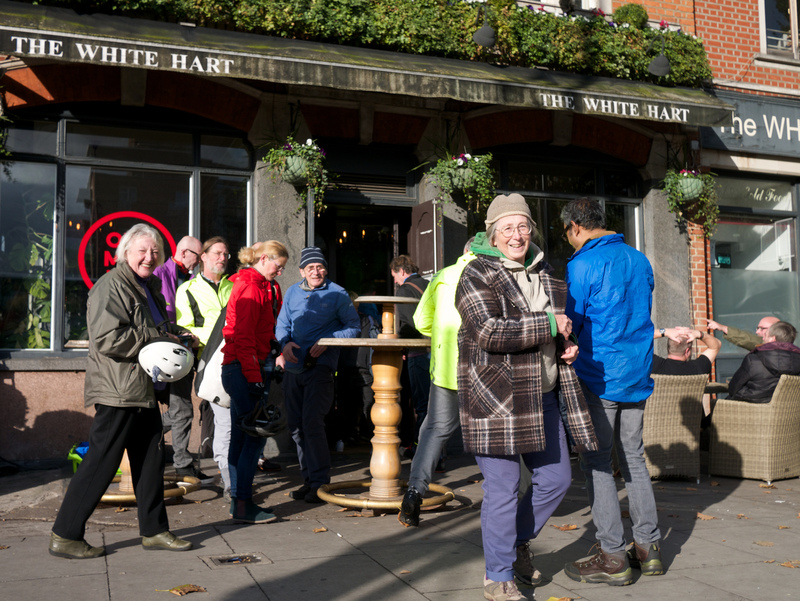 We set off at 12:15 and it was not long before we alighted on the first stop in Hackney Wick. After the first sample we left just as West Ham fans were arriving for the home match against Stoke. We crossed into Victoria Park where we found the first brewpub. Through the park and into Bethnal Green we were tempted to stop at Redchurch with it’s cosy bar, however we were on a schedule and so had to limit our trade to offsales. Down Cambridge Heath Road to 1 Mile End and stop number two. This gorgeous pub is located in Whitechapel, adjacent to the Blind Beggar and the old Watney Manns brewery, and we had a group photo with no bikes and no beer, strange. 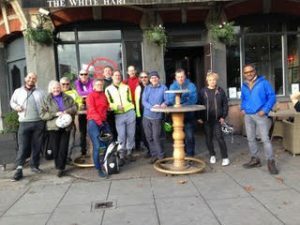 Thanks to Bill for his comprehensive research, more details are on the Newham Cyclists website and also to Robin, whose photos provide and excellent record of this unusual day out. and headed back up through the Ingrebourne Valley country park to Upminster, taking in the Col de Ingrebourne Hill with its panoramic views of East London. By the time we reached our destination there was a hint of light rain throughÂ theÂ sun, but nothing to compromise an enjoyable 26 mile runaround.